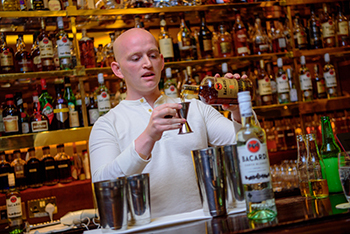 The final 2 heats of this years Bacardi Legacy UK competition recently took place with dozens of bartenders competing for the final spots. The format for Bacardi Legacy is misleading in its simplicity. 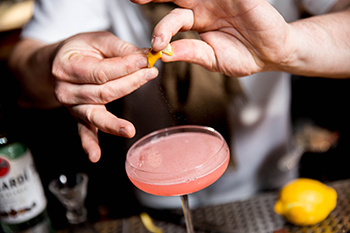 Create a fantastic Bacardi cocktail which can be easily replicated around the world and entertain the judges with your legacy inspiration. As always the simple things in life can be the hardest. Taking away the bartenders preferred competition option of obscure products and complex homemade ingredients ensures they think in a different way. 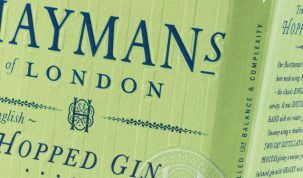 Relying on their skills of balancing flavours and creating drinks that will be enjoyed by people around the world. With the standard in Belfast and Edinburgh in the first two heats higher than we had ever seen before we were looking forward to seeing what Liverpool & London had in store. This years Northern UK heat took place in Liverpool, unfortunately BarLifeUK couldn’t make it so the judging panel consisted of Global Bacardi Ambassador, Dickie Cullimore, last years Northern UK winner, Chris Edwards and Bacardi UK Queen, May ‘replicability’ Constantinople. ‘Last years Northern heat of Bacardi Legacy was the most fun competition I have ever been involved in judging. This year in Liverpool there was no lack of laughter, great chat or clever and hilarious stories however this year I thought the drinks standard was even better than last. So it seems that Dickie is as big of a fan of the North as BarLifeUK is. From speaking with him in more depth the competition was really high and it was tough narrowing it down. Taking the runners up spot and getting himself a change for the wildcard place was Adam Day from Peggy’s in Manchester. 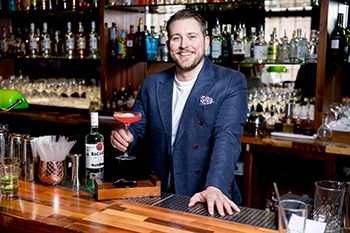 However taking out the top spot, was the Northern UK winner from 2 years ago who was back for more with his El Beso cocktail, Oliver Pluck from The East Village in Leeds. 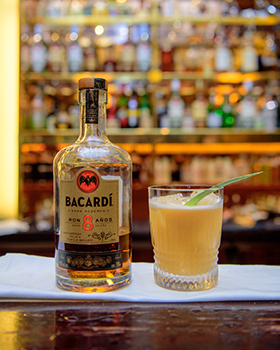 The London heat of Bacardi Legacy is always a marathon affair. The vast numbers of exceptional drink entries always gives May a headache when it come to narrowing the field down and results in a big day of judging. This year was no exception with over 20 bartenders competing for 2 places in the UK final. We knew the quality was going to be strong but we weren’t prepared for the level that was on show for the next few hours. Joining BarLifeUK on the judging panel was Dickie and last years UK winner, Joe Harper now residing at the Beaufort Bar at the Savoy, with May keeping a close eye on proceedings. Alex Godfrey had made his way up from Milk Thistle in Bristol but it was actually his childhood back in Australia that formed his inspiration, with all the ingredients linking back to family memories. For anyone that had spent anytime in Australia it was a walk down memory lane and the finished drink was a real crowd pleaser. Drawing on his relationship with his girlfriend Cosmin Tigroso from Nine Lives had one of the lines of the day, each ingredient was linked to his relationship and when it came time to shake he announced ‘All relationships can get boring so sometimes you have to shake things up’. The drink was equally as clever with soy sauce proving an inspired inclusion. 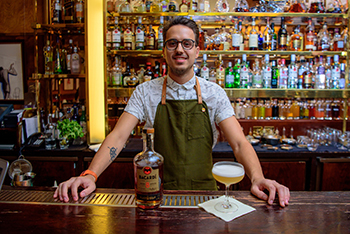 Each year we have judged Legacy Dominic Whisson from the Savoy’s American Bar has been there, and a red eye flight from South Africa wasn’t going to stop him this time either. An emotional performance revolving around his family produced a twist on the Gold Rush cocktail with the inclusion of avocado. He had thought of everything, including ingredients that all have their own emoji, and had importantly not lost sight of the most important aspect, a supremely delicious drink. Another returner to the fold was Robb Collins from LCC who once again lit the room up with energy and passion. His love of cinema was the basis for his chat, complete with clapper board, but it was the inclusion of dijon mustard in his Bacardi 8 yo serve that had the judges and crowd intrigued. It turned out to be an inspired move adding a real depth of flavour to the drink. Closing proceedings was Will Meredith from Dandelyan with one of the most composed presentations Bacardi Legacy has ever seen. Every ingredient and point was seamlessly worked back to the Bacardi family and his sour twist replacing the citrus with apple cider vinegar and egg with chickpea water was a fantastic example of how new styles can be balanced to create a drink that feels as if it has been around for years. Unsurprisingly with so many competitors the judging deliberation took a little while but in the end it was Will and Dominic who just edged out a very strong field to go on to represent in the UK final in Amsterdam on November 21st. There was one more matter to conclude however, that of the wildcard entry. At each heat a runner-up had been announced, one of those would be picked to join the heat winners at the UK final. That honour went to Robb Collins. 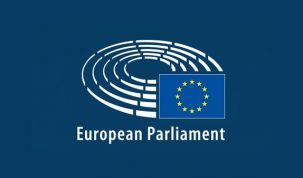 So there we have our final 6. It is going to be a really strong UK final and anyone of them will do the UK proud over in Mexico next year at the Global Finals. We will of course be bringing you all the news from Amsterdam in a couple of weeks time.